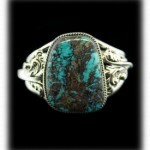 Bisbee Turquoise is one of the hardest turquoise stones to find. To discerning Turquoise jewelry lovers, Bisbee Turquoise Jewelry is recognizable by its true blue color and rich chocolate brown matrix. As you can see in the Bisbee Turquoise peice to the left, Bisbee Turquoise displays some interesting matrix patterns. This gorgeous brownish red matrix mixed with the true blue is what Bisbee Turquoise is know for and what people look for in Bisbee Turquoise Jewelry. 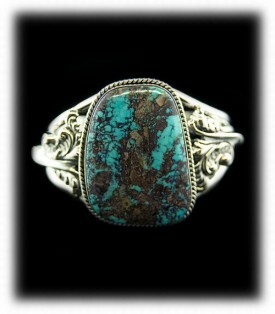 Bisbee Turquoise can also come in green, can be seen with very little matrix, or with a lot of matrix. Having said this, the most popular look of Bisbee Turquoise Jewelry is with Bisbee Turquoise cabochons that have a fair amount of matrix. This is due to the fact that it makes it easy to tell that the stone is definately from Bisbee, Arizona USA. There is no other Turquoise in the world that has matrix that looks like the matrix in Bisbee Turquoise. The chocolate brown to red matrix and the true blue color are un-mistakeable to any collector of Bisbee Turquoise Jewelry or Bisbee Turquoise. 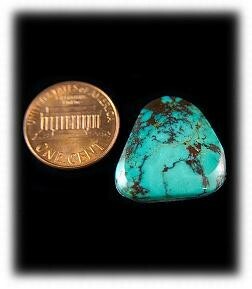 Bisbee turquoise is one of the hardest turquoise stones to find. To discerning turquoise jewelry lovers, Bisbee turquoise is recognizable by its true blue color and rich chocolate brown matrix. As it sometimes happens, Bisbee turquoise can show up without some of its more characteristic elements. 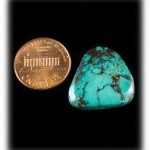 The Bisbee turquoise pictured is a freeform Bisbee blue American turquoise cabochon. The stone came from the Bisbee, Arizona, mines more than 35 years ago. It was cut from the Cecil Mickelson Collection, which was acquired by the Durango Silver Comany. Dillon Hartman of Durango Silver Co. handcut the stone, which measures approximately 23mm long x 21mm wide and nearly 4mm thick. But it’s green, a rarely known specimen from the Bisbee mines! For more on the rarity of Bisbee turquoise, read its short history that shorted supply and increased demand. When in Durango, be sure to visit Durango Silver Company for an upfront view of their current and vintage collections of authentic Bisbee turquoise jewelry.